The Book of Romans is a theology-rich epistle written by Paul filled with gems of pure gospel, written to the Roman church at a time when there is cultural awkwardness between the Jews and the Gentiles in the city. Romans 8 has been lauded by some as the Great Eight, and indeed in this chapter alone there are many verses that emphasize the extent of God‘s love, power, authority and promises. Romans 8:28 is one of those promises, arguably one of the most loved promises in the Bible. It is the favourite verse of one of my mentors – perhaps it is more apt to call it his life mantra – he says it so regularly that it is such a powerful reminder in my life as well. Through circumstances that seem evil and pointless, it is this verse especially that helps us to continue to trust in God. At times, perhaps desperately, I’ve clung on to this notion that ‘all things’ – all the good and bad things – will ultimately turn out for my good. NLT: God causes everything to work together for the good of those who love God. The main difference is whether the subject of the phrase is God or all things. So does God work to make a good purpose in all things, or do all things naturally already work together, by His design, for our good? While KJV makes it sound like all things work together for good without requiring God‘s intervention, it would be clear from the original Greek wording or from cross-referencing other versions that God‘s role is clear in this verse – God is the one who makes all things work for good – whether he caused it (design) or whether there is an active intervention (labour). I mentioned earlier that all things include all good things and all bad things – when referring to this verse there is a tendency for us to be so one-sided – often, we either only recognize this verse for all bad things (after all the context before and after this verse are largely about the bad), and we forget that in our good circumstances, it is God who caused them as well, and that there is a good purpose behind them as well. In good times we often forget God. Or, we are so grateful to God in our good circumstances that we look at this verse and say yes, God worked for my good – and we forget that God works in bad things too – and that they are coming. Almost every verse in the Great Eight (Romans 8) can be quoted here to make a point – Rom 8:17 says we share in his sufferings in order that we may also share in his glory – we are glorified in our sufferings; and our sufferings are not worth comparing with the glory that will be revealed in us [Rom 8:18]. All things work for the good of those who love God. Even if you are suffering today, you will soon be glorified in a way that cannot be compared with your current pain. It is clear from the verse that this promise is not meant for everybody. It is only available for those who love God, and are called according to his purpose. 2 conditions here: love God, called by God. If you try to think about it, it is hard to think of the two as separate. Bearing in mind the distinction between us loving God versus God loving us – Can you love God without having been called by Him? And would someone who has been called by God not love Him? Well, the second statement is probably more likely than the first, because loving God is up to us humans, it’s what we have to do, and because we are humans, we’re weak, we’re inconsistent, and we are subjective. But God calling us is objective. God calling us is (thankfully) not up to us, and thus it is consistent, it is strong, it is powerful, it is divine. And God doesn’t just call us – He called us according to his purpose. And this is the root to the promise in Romans 8:28 – God called us according to his purpose. 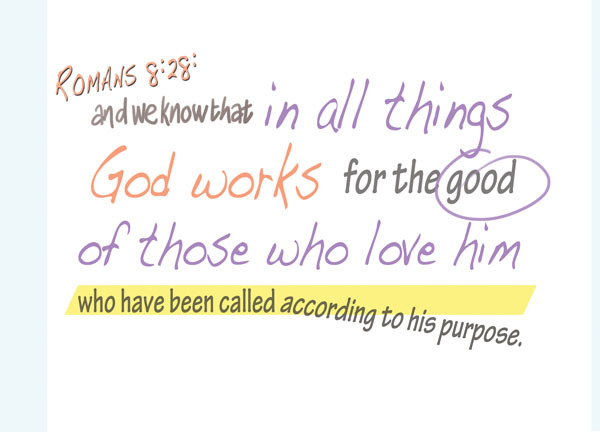 This is what makes Romans 8:28 so unshakeable, so reliable, such an assurance for us. It is not based on our love of God, which may exist today but weaken tomorrow. It is based on something rock solid, and that’s God. Paul says, and we know in all things… Do we really know? I don’t know. I’m guessing that what Paul is saying here is that this verse is so unshakeable and so clear that it is something that we, with our limited understanding of God‘s greatness, can know clearly and be assured in. In the end, by saying we know, Paul is giving us an encouragement, a hope, an assurance. We don’t know a lot of things, and we don’t always know what we want, and sometimes we don’t even know what we’re praying for, but this we can confidently know – that in all things God works for the good of those who love him, who have been called according to his purpose. Joseph is the perfect example to the message behind this verse. We see the unfolding of God‘s purpose as intended for the good of Joseph and the first family of Israel manifested out in bad things that had happened to him – first being betrayed by his brothers and sold off [Gen 37:28]; then being innocently accused and jailed after working his way up to standing [Gen 39:20]. Eventually we saw how those bad things were but just a prelude to Joseph bringing Israel over to Egypt to escape from the famine – But God sent me ahead of you to preserve for you a remnant on earth and to save your lives by a great deliverance [Gen 45:7]. God‘s wonderful purpose had played out in the end. And there are many other examples in the Bible – Naomi, Esther, Job, amongst others. I’ve certainly not done this verse enough justice by such a shallow study of it – 1000 words is far from sufficient to truly appreciating this verse. Yet the Bible cannot be explained merely with one verse – but one verse can be explained with the entire Bible. Subsequently, there will be case studies and other verses that echo out a similar message, and this verse will most certainly be revisited again and again. There are many examples of all things work for the good of those who love God in the Bible; there are many examples of all things working for the good of those who love Him in modern times as well. Actually, everything that happens in our lives are examples of this verse – it’s merely the degree of the event, and our clarity to it being part of God’s purpose that differs. It is a great promise – everything works for the good of those who love Him – and it is a promise that we can know for sure and be confident in. This was absolutely on the mark and so beautifully written and true. Thank you so much for breaking this down for us, and yes, it’s true, we can always go so much deeper, but thank you for scratching the surface for us and for sharing what the Lord clearly put on your heart. My spirit rejoices with what you have written and it truly gives hope to all who read and partake of it. Many blessings to you! I always enjoyed this verse, but the major point of what the good is, is found in verse 29. What’s good for us is that we are conformed to image of God’s Son. That’s what makes all the circumstances good, because God is using them to make us like his Son. We have to accept being formed to the likeness of Jesus Christ is always good for us, and is better for us in the long run. Keep up the great work and thank you for liking my post!